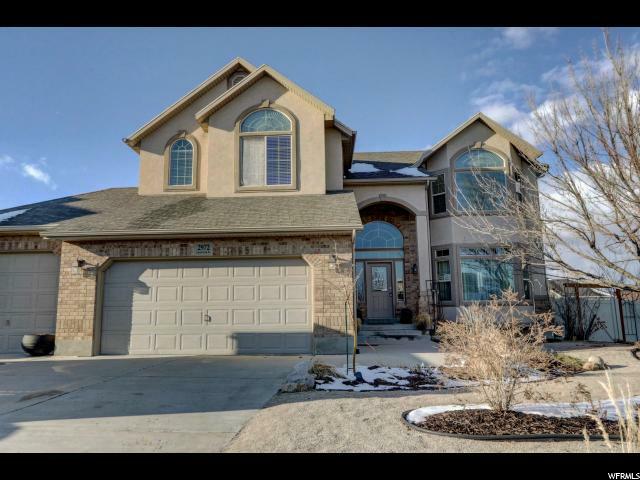 All MIDAS CREEK ESTATES homes currently listed for sale in South Jordan as of 04/24/2019 are shown below. You can change the search criteria at any time by pressing the 'Change Search' button below. "Living is an adventure in this impressive, generously spacious residence with beautiful mountaintop views. This breathtaking home contains 7 bedrooms/4 full baths/ 1 half bath and will capture your attention with its alluring front yard and charming flower beds made just right for the planter in your family. Take a peaceful walk under the covered walkway leading into your remarkable new home. As you walk in, there is an exquisite sitting area to you right, with a beautiful wide-open window to entertain your unexpected guests. Straight ahead, is the inviting dining area and kitchen with alluring features like hardwood flooring, beautiful stainless-steel appliances, pot filler, and granite counter tops. Take a turn around the corner to see another cozy family room with inviting features like a fireplace, spacious shelves, and a tv hookup. Take the office home to your extra room giving you plenty of space for your file cabinets, bookshelves, and computer desk. Located upstairs is the luxurious master bedroom with stunning modern lighting, striking scenic views, and a spacious walk in closet. Located on the same floor is three bedrooms and in addition is a bathroom giving full access to your guests. Walk downstairs and be amazed by the extravagant one-of-a-kind basement. This basement includes a large open living room with tv hookups and shelves, kitchen, and extra rooms that can be used as a gym. Take yourself on an adventure into the backyard. Let your children slide into some fun on the built-in play structure, while you relax under the beautiful covered sitting area. This tasteful listing will not last long! Call or text for more photos or information! Fruit trees include: 2 peach, 2 apple, 1 cherry, Blackberry and raspberries. The garage is plumbed for hot and cold water, surround sound downstairs, fireplace plumbed in for downstairs, new paint and carpet, new AC and Furnace, new kitchen appliances, new bathroom countertops, and kitchenette downstairs. "